UPDATE: Nonito Donaire Jr. defeated Wilfredo Vasquez Jr. via split decision! Congratulations to the Filipino Flash Donaire for retaining his belt! You bring glory to our country Philippines! We are proud of you! Mabuhay ka! Watch Nonito "The Filipino Flash" Donaire Jr(27-1-0 18 KO’s) against the top contender and challenger Wilfredo Vasquez Jr fight set this Saturday of February 4. Nonito Donaire of Philippines, the three-division world champion and at the same time, the reigning WBC bantamweight champion of the world. While Wilfredo Vasquez(21-1-1 18 KO’s) of Puerto Rico is hungry for that title fight on his waist. The Donaire VS Vasquez fight is on live this February 4, 2012 in Alamodome, San Antonio Texas. The Battle of Junior VS Junior, Donaire Jr Vs Vasquez Jr, and a made to be one of the most promising fight that will clash in every way of these boxers. A history marked on boxing, Donaire's wife vs Vasquez' wife during the boxers' weigh-in where both of them through some mouth talking through Vasquez who turns Donaire's cap and the fire was just the beginning, here comes after the weigh-in, Donaire's wife throw some hated words to the camp of Vasquez and the latter's wife do the exchange of words. Vasquez's wife and Donaire's wife have gotten into the heat of the battle even on twitter. Is this a game plan for Vasquez inorder to lose Donaire's focus on his best game plan? The live streaming of Donaire vs Vasquez will be updated soon whenever the Donaire VS Vasquez fight start where there will available live streaming en route to the fight, our team will be working on the Donaire VS Vasquez live streaming and will do our best to deliver your expected result for Donaire VS Vasquez fight. Please keep updated. 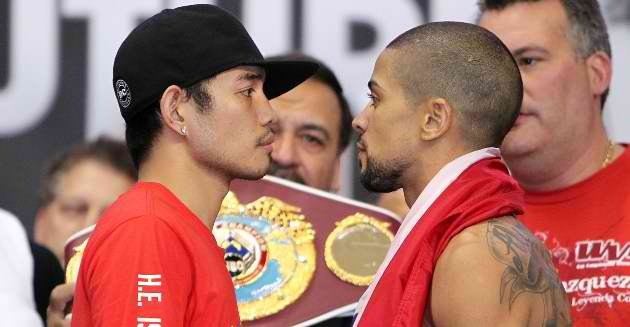 Donaire vs. Vasquez will be on Live Telecast on ABS-CBN (February 5, 2012, Sunday) Philippine local time. The Fight will be broadcast on ABS CBN Network at 10:15 am local time. If you want to wath the fight via live TV streaming on ABS CBN network, just follow the instruction below because we'll provide it for you boxing fans. Our team will be broadcasting the live results for Donaire vs Vasquez en route to the double-header main event WBO Middleweight Champion Julio Cesar Chavez Jr. against top challenger Marco Antonio Rubio. The result of the fight will be posted right here on this page. Just hang on this page. Thanks. The video replay of Donaire vs Vasquez fight will take more hours or 1 to 2 days delay before we can provide you the video replay of this much anticipating fight. But will working on it to catch the video replay of Donaire VS Vasquez with the help of our website partners. Please have your patience. Thanks. Disclaimer: We are not the owner of this video replay, we just share this video through some other media sharing source site. If you find this video (especially to the owner) is offensive or not suitable for this site, you may remove this video from the source itself or you can comment below, so that our team will immediately remove this shared video. Thank you.